New insights into thermal conductivity of graphene and how it can propagate heat so efficiently might add yet another talent to the repertoire of this carbon allotrope. Keeping cool when it comes to microelectronics is a perennial problem, with an endless arms race between shrinking circuits and the self-destructive heat they generate. That ubiquitous wonder material, graphene, may turn out to be the solution to the problem of the electronic heatwave, providing an escape route through its very high thermal conductivity. Conventionally, heat propagates through a material as vibrations of atoms - these vibrations, known as "phonons", can collide with each other, merge or split, all the while reducing a material's overall thermal conductivity. In the past, it was assumed, and occasionally observed, that at temperatures well below -200 Celsius and close to absolute zero, quasi-lossless heat transfer might be observed. In 2D materials, however, things are different. The EPFL team has shown through computer simulations that heat transport can occur without significant loss at much higher temperatures - not only in graphene, but other two-dimensional materials such as boron nitride, and the functionalized derivative graphane, for example. The team explains this lossless conduction as being due to the wave-like diffusion of second sound. In this phenomenon, the phonons all move in concert over very long distances within the material, thus avoiding energy-diffusing collisions, mergers and acquisitions. "Our simulations, based on first-principles, have shown that atomically thin sheets of materials behave, even at room temperature, in the same way as three-dimensional materials at extremely low temperatures" explains Andrea Cepellotti, from the Laboratory of Theory and Simulation of Materials at EPFL. "We can show that thermal transport is described by waves, not only in graphene but also in other materials that we are just learning how to make," explains Cepellotti. "This is exciting new physics, but also extremely valuable information for engineers, who could exploit the design of future electronic components using some of these novel two-dimensional materials properties." 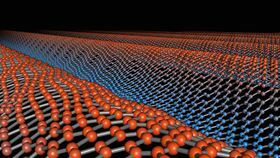 For the first time, researchers have produced a coherent qubit made from graphene and the 2D material hexagonal boron nitride.